Facebook on Thursday launched Camera, a new standalone iPhone app for browsing your friends’ photos and sharing new ones of your own. Were Instagram owned by anyone else, it might be sweating bullets right now. Facebook Camera puts a thin strip of your Camera Roll photos at the top, with your photo news feed taking up the rest of the screen. When Camera launches, it shows a thin strip of photos from your iPhone’s camera roll, along with a button to start taking new pictures. Beneath that is the Friends tab, a vertically scrolling, Instagram-esque list of photos your Facebook friends have taken. One of the clever things about Camera is that it includes not just those photos your friends take within the app, but any photos that they share on Facebook itself. Not all of those photos will fit well in the square-cropped versions that Camera presents, but you can tap on any photo to see it uncropped. A second tab called Me lists photos of you. I think. My Me tab includes photos I took and photos in which I’ve been tagged, but it doesn’t include every such photo; it notably didn’t include photos I’d taken moments earlier with the Camera app itself. Taking pictures and adding filters feels very Instagram-esque. When it’s time to snap a photo within the app, you get the standard Camera controls, though they’re restyled a bit. 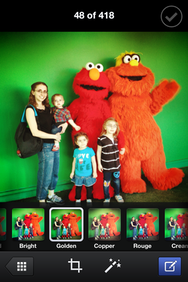 Once you snap a photo you’d like to share, you can tap into it to crop it, apply a filter, and/or share it on Facebook. (You can do the same with photos from your Camera Roll.) Camera automatically detects faces in photos, and prompts you to tag them if you’d like. Applying those filters feels very familiar if you’ve ever used Instagram. Though they don’t sport the same names as Instagram’s filters, Facebook Camera’s filters offer the same basic saturation- and contrast-tweaking options. You can post one or more pictures to Facebook at a time. This is a 1.0 release and as such is a bit quirky: I found that sometimes filters didn’t apply properly when I tapped on them, and that sometimes the filter preview icons—which are meant to show the intended effect on your current photo—would sometimes erroneously switch to showing a different photo of mine instead. Other times, I’d go back to the app’s home screen and see my photos, even though the Friends tab was seemingly selected; tapping back and forth between the tabs corrected that issue. 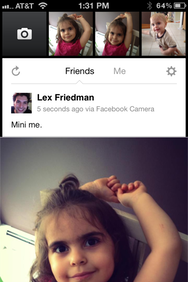 So, Facebook Camera will inevitably draw comparisons to Instagram like the few I’ve already listed. But to me, the apps don’t seem especially competitive. For Facebook devotees, Camera is probably the better app; it integrates more tightly with the service, and shares photos from all of your preexisting Facebook friends. But members of the Instagram community who prefer it there, with those filters and added options like tilt-shift, needn’t envy their Facebook Camera-using friends.